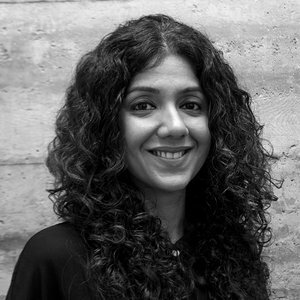 Tania is the Founder and Design Director of tsk Design, a leading brand design firm in Bangalore, India. She received a BA in Studio Art from Mount Holyoke College, and an MFA in Graphic Design from Yale University. In 1997 she returned to establish the firm at a time when design was still nascent in India, and helped pioneer what is now a thriving creative industry. tsk Design has created exciting design solutions across corporate, education and hospitality businesses, while in parallel designing for culture and the arts. Clients include global brands like Wework, MTV, SAP and Sandisk; and leading Indian companies like Biocon, Asian Paints, The Taj and The Park Hotels. Tania is inspired by her context – a rapidly evolving urban India that co-exists with a culture that is rooted in its unique identity. This creates immense possibilities for business and design. Tania’s focus has been to create impact through design that is contextual, fresh and beautifully crafted. Both in and outside the commercial practice, she draws from local sensibilities, both visual and cultural. Examples of such ‘hybrid’ work include branding MAP: Museum of Art and Photography; ABC Desi, a uniquely Indian alphabet book; and Curry, an eclectic font combing Devanagiri and Uncial. The firm’s work has been showcased at the V&A (London), Wallpaper’s GlobalEdit of 100 global designers to look out for at Salone Del Mobile (Milan) and Experimenta Design (Lisbon). Awards include Blue Elephant at Kyoorious Creative Awards, co-winner (products) at EDIDA, Elle Deco International Design Awards and winner at Designomics. Tania has been a speaker at Institute of Contemporary Arts, London, ID India Design, Delhi, TEDX, Bangalore and Kyoorius Design Yatra, Goa. She has been on the jury of the D&AD Awards, Dubai Lynx and Kyoorious Design Awards and has been visiting critic at the Srishti School of Art, Design and Technology.